You must have heard or read about the 7 rays in the atmosphere during school days or in science journals having seven colors viz, red, blue, yellow, green, orange, indigo, violet. However, there are 12 rays and many of these we cannot see with naked eyes or directly. Out of these the 7th Ray is for the Violet Ray regarding which we will discuss today in this article. This ray is of change, transformation and transmutation, magic, the inner change and transformation versus external change, the “Violet Flame”. 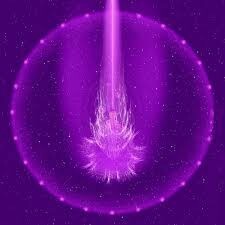 St. Germain is the overseer and the Ascendant Master (chohan or lord) of the seventh ray: “The Violet Flame”. The twin flame of Ascended Master St. Germain is Lady Portia, the Goddess of Justice. St. Germain greatly promotes the freedom's flame and Lady Portia, promotes the flame of justice and opportunity. The name Saint Germain origins from the Latin word 'Sanctus Germanus', meaning “Holy Brother”. The Archangel associated with this ray is Archangel Zadkiel. Many diplomats, guides of the sacred fire, actors, writers and defenders/protectors of freedom serve and work closely with Saint Germain on the seventh ray. It is not just a ray or beam of light; it is much more than that. I personally have tried its cleansing process and felt the shift in energies when using violet flame cleansing method. Violet Flame not only cleanses you, however, it also helps accelerate or enhance one’s spiritual development also. It can be used for different purposes such as healing physical, emotional problems and improves relationships. It transmutes the negative energy into positive, revitalizes & restores your energy field. The roots of many diseases, negative thoughts and feelings lie deeper in our emotional and mental body states; here violet flame with the power of its transmutation and transformation provides us an easy platform to heal all these issues and problems. It’s a universal gift of god, which once you learn to use, will find it really beneficial in cleansing, transmutation as well as protection. There could be times when you may pick up other people’s negative energies and thoughts around you, which may affect your auric field, so the moment these energies enter your auric field, they will start affecting your energies also negatively, so it is always recommended to keep your aura cleansed and shielded so you stay unaffected from energies around you that are not in your highest good. When you use violet Flame or invoke it, it is not necessary you see it or hear it, you may simply feel tingling, or positive energies around and like a load is lifted u and released from your body, mind, heart or soul. Violet Flame is much intense cleansing method that can help you release and transmute the ties of past live karmas, experiences or situations you may be carrying as a load in this life too and that are holding you back from living a much happier, lighter and joyful life than you currently are living. To Light alone I bow. When I used this decree on myself, instantly I felt the shift in vibrations I had, Elizabeth Clare Prophet, has explained the benefits and meaning of using this decree so well, when you repeat "I AM the violet flame" every time, it means you are accepting the fact "God is in me is the violet flame", allowing him to transform you in a way making you more close and united with God, with the oneness we all must live our lives. Elizabeth had actually validated the fact that when we use Violet flame it allows divinely to help us recall the karmas or karmic ties, past actions or emotions stuck in our mental or emotional bodies (sometimes they may be present in form of a physical disease) through Lucid/vivid dreams. It’s like self-realization and then on soul level you get rid of that emotion, issue or karma due to which you might be facing issues in current life. You soul knows the universe and its laws so, when it chooses not to repeat that action again, the karmic cycle is broken. If there is a situation in your life or experience or relationship you do not know the roots of its sufferings, it might be a sign to you to look into your past life and violet flame/fire can prove to be a useful tool here for you. You may be reminded of your past life incident in vivid dream only when your soul is ready to deal with it. During hypnosis sometimes it may lead to all sorts of thoughts that may not even belong to you or that situation. This could create confusion and lead you to unsolved matters and unanswered questions regarding your situation. However, Violet Flame is itself a flame of God, so he will himself reveal your past to you through dreams or visions and that too the part you can deal with at the moment in your life. Sometimes, not everything is required to be revealed or recalled even. So, this is the time when you can dissolve your past karmic actions, but how you can do it? Whenever, you start getting the visions or thoughts haunting you from childhood or past pains, visualize a giant Violet color Eraser/Duster, like we used during our school days to erase what was written on the blackboard. This will work miraculously for you as after certain days you will definitely observe the positive shifts and differences not only in your thoughts but your overall personality, feelings, and dealing with day to day traumatic or stressful events, people or fears. Once you erase what is not serving you anymore, ask violet flame and God to guide you to take your next step towards your life’s plan (No! No! No! it is certainly not your next job or how to get going with all desires and all, it is the sacred plan you already had contracted with higher beings and world before coming into this lifetime to fulfill it in this lifetime which you could not do in the past lives for certain karmic cycles or situations). You have the power to erase and re-write your life’s plan now. Connect with your masters now to review you life’s plan and see how you can restart your journey towards its fulfillment. The first most thing or change you will see in yourself is “Forgiveness”, you will start feeling positive, with self and others around and tend to surpass or forgive easily others mistakes/actions. It’s ok to forgive and forget as it is for your own betterment and allowing yourself to move forward in your life by untying the knots of past which are no longer serving your highest good. So here we are repeatedly talking about transmuting the negative energy, so in what forms it can exist? It can be negative thought patterns; disease or accidents often you may be encountering, deep-seated habit patterns due to which you often find it difficult to get along with others around you. Your Aura not only reflects your positive energies you may be holding, but also the feelings of hatred, jealousy, anger, emotional sigh etc. This is often due to your own thoughts, past karmic energies, and energies of others around you. If you recall an incident where you were so happy when you entered a room, however, the moment you entered inside, all of a sudden you started feeling irritated and angry. This could be due to the energies that room held with other people sitting out there or probably the person sitting near to you holding angry energies and passing on to you unknowingly. If this energy solidifies around you like a dark pit or cloud, it may make you feel annoyed, low on energy or may be irritated too on things you might not easily get angry, weighing you down heavily with its load. So, even if you are a newbie to spirituality, you can still start off your journey with violet flame cleansing or invocation (mind it, it is sacred and no game so maintain the respect when you invoke it). Regular practice of these decrees will help you take one step forward each time to reunite you with your Higher Self and God improving your relationship with self and God. Violet Flame works on a psychological level transmuting our fears, threats, negative energies, thoughts and even transmutes the psychic debris. You may also use Violet Flame to protect yourself, I can guarantee you, it will work wonders because in the past I had used it and it works awesome when you have no choice but to visit a crowded place or meet a person to whom you do not want to let read your thoughts or aura and be safe. Some people have the habit of reading mind, thoughts or your personal life psychically to show off their psychic abilities without intent to help you but to show off, if it makes you uncomfortable or threat to your privacy, use Violet Flame Decree and see how it works. So, before we conclude this article, I want to share how violet flame actually works. Once you understand the science behind it you will be able to better use it. As I had discussed in one of my previous articles on Chakra – The Energy Vortexes, we all have four kinds of bodies viz, Physical, Emotional, Mental and Etheric and we all have electromagnetic field around us as we all are made up of atoms, and the nucleus that we all have read and learnt during our science class (it is not just in books but reality of our existence), the vibrational field around us works on this empty space held by the electrons (electromagnetic field) and it is this empty space between the nucleus and the outer edges of the mass of atom, where the negative energy gets clogged. The Violet Flame has the ability to enter these spaces and uplift and transmute & transform the negative energy to positive and free up the space to let the cosmic energies of our beings flow freely in all of our bodies removing all clogged energies, causes of diseases, illness, improving the immunity and restoring our ability to survive and stay healthy and happy in all of our bodies providing more of the rejuvenation and vitality. The clogged karma or negative energy creates discomfort and acts as a barrier to the free flow of the cosmic energies into our physical as well as elemental bodies. The moment this happens, our electromagnetic field starts resonating with these negative energies causing more problems, blockages and imbalances physically, mentally, emotionally and ethereally. It then separates us from the awareness of our own God presence being and causes diseases or illness lowering our resistance and immunity level to deal with these dis-eases. Violet Flame has the power to surpass these clogged particles and dissolve them hence increasing the vibrations and making you healthier and allowing free flow of cosmic/positive energies in all of our bodies. Whenever you feel like washing yourself off any kind of negativity, call the St. Germain, Archangel Zadkiel and Angels of Violet Flame and experience the bliss and purity within! Try it! Love, Light, Peace, Gratitude and Blessings to all!! !